Nothing beats like an award given the second time around. 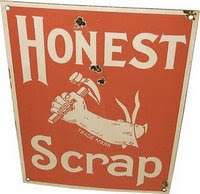 Thanks to Mommy Chris of The Mommy Journey for this Honest Scrap Award. Mommy Chris is our gracious host to the meme Mommy Moments. Go visit her blog now so you can share your Mommy Moments too! - Choose a minimum of 7 blogs that you find Brilliant in Content or Design and pass this Award. - List at least 10 honest things about yourself. I am going to break Rule #1 and would like to pass this on to EVERYONE in my BLOGLIST. 1. I love making TO DO lists for the day but never get around to finishing all of them because I tend to move too slowly. I have my "own pace" as Hanhan would say, without a care whether I am going to be late for the train or not. 2. SORRY and THANK YOU are my most used words. And I do mean it when I say them. 3. In my recent medical check-up, my doctor said that everything is normal except for my liver, which is a little fat. He said there is no cause for worry. All I need to do is watch out what I eat and take long walks. Afraid that it could get worse, I always tell myself this: "I will start exercising and dieting TODAY" but never got around to actually doing it. 4. Books are a source of inspiration for me and I have a long list of books waiting to be purchased and read. 5. I wish to receive a few things for my birthday: a new desktop PC, a bag and a wallet, a new camera, and a pair of pearl earrings. Hehehe! SImple lang kung mangarap ano? 6. I wish I have a green thumb so that I can grow my own little garden. I already have a design in mind. I just don't have the space to make it yet. 7. When I was little, I used to go to a water cabbage (kangkong) pond, get into the knee-deep pond and get some fresh kangkong to feed to our pet pigs. I am afraid of slugs but I love our pigs, so there! 8. I want to give baking a try as a hobby. But first, I need some baking equipment and some good baking tips. Anyone willing to teach me? 9. I never wear any make-up, not even face powder or lipstick. There are only very few occassions when I can remember wearing one:my graduation day, my sister's wedding (I was Maid of Honor), my wedding. Maybe I should learn how to wear one. I always envy women who know how to put on make-up and make it look so natural. 10. The Lord of the Rings is among my favorite movies and I never tire of watching it.